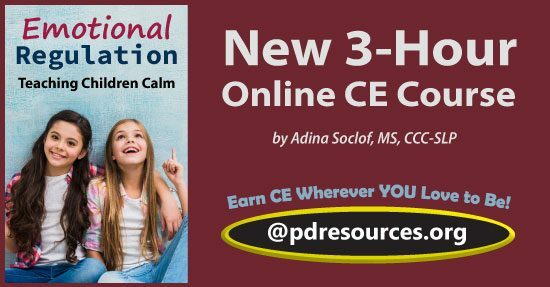 Emotional Regulation: Teaching Children Calm is a new 3-hour online continuing education (CE/CEU) course that provides strategies and techniques for helping children to navigate their emotions. Emotional regulation is the ability to manage one’s emotions in order to respond appropriately to life’s inevitable ups and downs. It assists with competent decision-making, augments memory for critical events, and enables productive interpersonal relations. Inappropriate emotional responses are implicated in academic struggles, social difficulties, and many forms of psychopathology. Although children with emotional regulation issues may be at a disadvantage, adults can employ a variety of strategies to help them succeed. Emotional Regulation: Teaching Children Calm is on online course and provides instant access to the course materials (PDF download) and CE test. After enrolling, click on My Account and scroll down to My Active Courses. From here you’ll see links to download/print the course materials and take the CE test (you can print the test to mark your answers on it while reading the course document). This entry was posted in CE Courses, Counseling CE, Marriage & Family Therapy CE, Mental Health, Occupational Therapy CEUs, Psychology CE, School Psychology CE, Social Work CE, Teaching CE and tagged @pdresources.org, CE, continuing education, Emotional Regulation, Emotional Regulation: Teaching Children Calm, Professional Development Resources, Teaching Children Calm by Gina Gunderson. Bookmark the permalink.